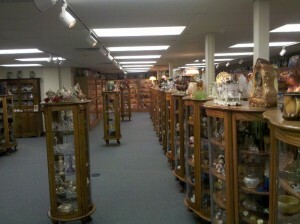 One of the largest private collection of antiques in the country! The Baker Family Museum is a unique and fascinating collection of various types of antiques. It is a private collection of over 300,000 pieces from many local glass companies including Cambridge Glass, Heisey, Fenton, Westmorland, and Degenhart. Also in the collection is a vast array of pottery from such companies as Weller, Shawnee, Roseville, and McCoy, as well as one of the largest collections of very fine hand painted porcelain china of R.S. Prussia. Additional display rooms and settings showcase antiques of an old-time kitchen, cream processing, antique guns, teacher’s and miner’s desk area, lamps, grandfather clocks, music boxes, and many other historical items of yesteryear. Together, each component creates a lure that even gains the respect and appreciation of studied collectors.